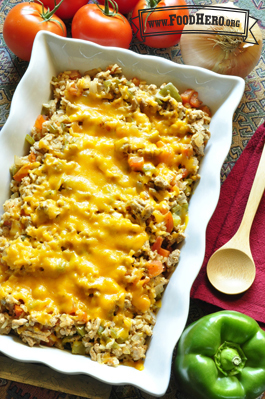 3 Comments for "Spicy Rice Casserole "
This is perfect for my husband and I. We do the bell pepper, and then he adds hot sauce to his plate because I don't like spicy foods. I like how this is only 10 minutes of prep and while it cooks, you can do the dishes! A tasty, quick and easy to prepare meal. I prepared last night for a Parenting Class with adults and youth. Because I used green bell pepper and had bottled hot sauce available, all could have the level of heat they preferred. It seemed to be a hit and they liked how simple it was to make. Good! A little spicy but perfect for winter!